Standardized with 80mg diosgenin per capsule. Wild yam (dioscorea opposita selvatica) with Black Cohosh. Combined with the progesterone hormone produced by the body, diosgenin is important in maintaining the balance between estrogen and testosterone. Wild yam can help stabilize this sensitive balance. A number of significant researchers have conducted studies on DHEA. Results show that DHEA increases people's vitality and sense of well-being particularly in mid-age and as they get older, supports the body's immune system, has a positive effect during menopause and increases libido. Wild yam balances hormone metabolism in both men and woman and stimulates adrenal gland production of DHEA (dehydroepiandrosterone). DHEA is said to have an anti-ageing effect. Wild yam is also available as an aloe vera gel. Contents: 60g = 90 VegeCaps containing 536mg each with 80mg diosgenin. Diosgenin, a substance found naturally in wild yam, helps the body produce DHEA (dehydroepiandrosterone). 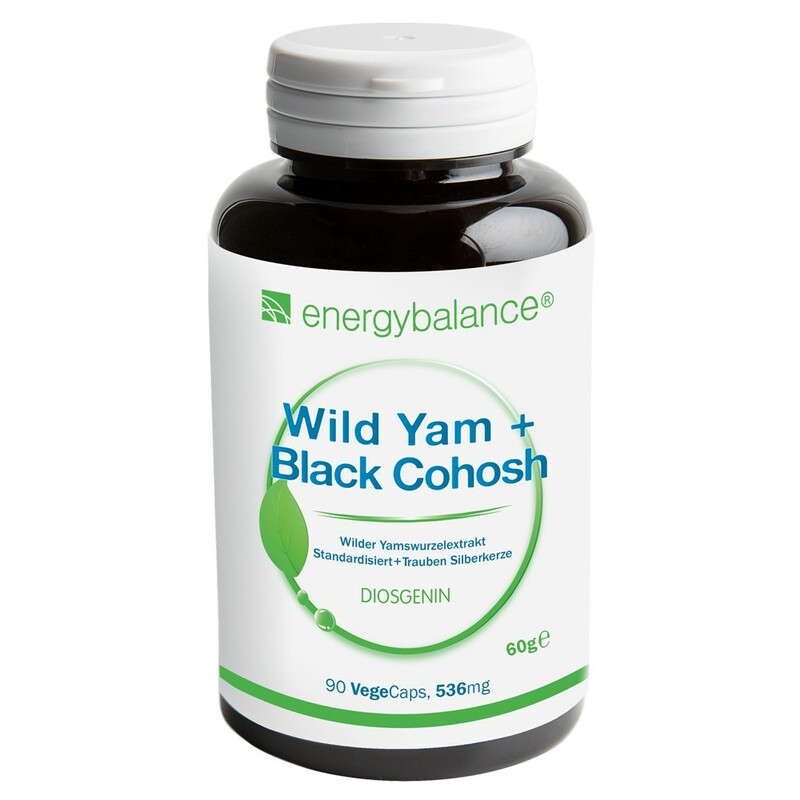 The root of the wild yam contains diosgenin. Combined with the progesterone hormone produced by the body, diosgenin is important in maintaining the balance between estrogen and testosterone. Wild yam can help stabilize this sensitive balance. A number of significant researchers have conducted studies on DHEA. Results show that DHEA increases people's vitality and sense of well-being particularly in mid-age and as they get older, supports the body's immune system, has a positive effect during menopause and increases libido. Adults take 1 capsule 1 - 3 times a day before food. 60g = 90 VegeCaps of 536mg with 80mg of diosgenin each .